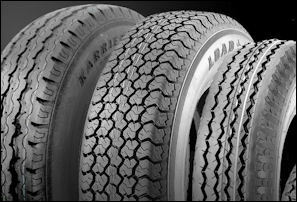 Tech Info - TRAILER TIRES .COM, The Trailer Tire Superstore! There are many things to consider when determining which Trailer Tire is right for your trailer. We are going to discuss the main points that need to be addressed when outfitting your trailer with new Trailer Tires. Should you use Radial or Bias-Ply? Should you use Load range C or Load Range D? Do I have to use an ‘ST’ tire? These are all good questions. First off, we will revisit the Radial vs. Bias-Ply debate that was covered in a previous blog, only today’s entry will be much briefer. Radial tires are going to be better suited for highway/high volume usage. This is because they tow better at higher speeds and last longer than a Bias. They also shed heat better, reducing the risk of blow-outs on long hauls. Bias Ply tires are cheaper alternatives that perform just fine under moderate to low use on mainly secondary (around town) roads. You can absolutely use them on the highway; they just won’t perform as well or last as long as a Radial. Secondly, we will address how to determine the appropriate Load Range (L.R.) for your trailer tires. I would like to address the common perception that a higher L.R. automatically means a higher quality tire; this is not always the case. The L.R. should be determined by using the GVW or Gross Vehicle Weight. Depending on the type of trailer, tongue weight can be anywhere from 10-20% but we do not like to use that weight in our equation so that there is a built in safety margin. Take the GVW and divide it by the amount of tires. This will give you the minimum poundage that each tire should be rated at. Keep in mind that the higher the L.R., a higher PSI will be needed. If you go over and above on L.R. then the PSI will be higher than needed making the tires very hard and bouncy. Finally, it is always recommended that an ‘ST’ or ‘LT’ tire should be used on trailers. This is a common question because many trailers are outfitted with tires that have a ‘P’ on them. A ‘P’ on the tire means that it is meant for use on a Passenger vehicle (car tire). ‘P’ tires are round and rubber and will surely fit on a trailer, but are not recommended due to the construction of the tire. ‘ST’ tires are designed to be towed and have stronger sidewalls needed for trailers. We hope this was helpful but if you have additional questions, please give us a call @ 1-800-453-7379.